All of our catering options are right here. But if you want to customize something or have any questions, just drop us a line. We’d love to chat about it. All catering must be finalized no later than 24 hours before the event. Feeds 8-10. 8 Burritos cut in 1/2 for snack size (made in 10 in tortillas): 2 guapo, 2 pork, 2 chicken, 2 veg. Large bag of chips with 2 half pints of salsa and 1 half pint of guac. Feeds 8-10. Sliced (4 pieces) quesadilla with salsa fresca: 4 cheese, 3 chicken, 3 pork, and 2 steak. Large bag chips, 2 half pints salsa, and one 1/2 pint guacamole. Feeds 12-16. 4 quesadillas: 1 each of cheese, pork, chicken, and steak. 4 burritos: 1 each of guapo, pork, chicken, and vegetable (made in 10 inch tortillas and cut in 2 pieces). 6 taquitos (cut in 1/2), 1 each half pint of salsa fresca, fire roasted guacamole, crema, chipotle sauce. Includes plantains. Option of whole wheat tortilla upon request in advance (48hrs). Black beans, Mexican rice, Jack cheese, Romaine lettuce and salsa fresca. Cut in half. Veggie. Black beans, Mexican rice, Jack cheese, Romaine lettuce and salsa fresca. Cut in half. Grilled steak. Grilled chicken. Black beans, Mexican rice, Jack cheese, Romaine lettuce and salsa fresca. Braised pork. Grilled chicken. Black beans, Mexican rice, Jack cheese, Romaine lettuce and salsa fresca. 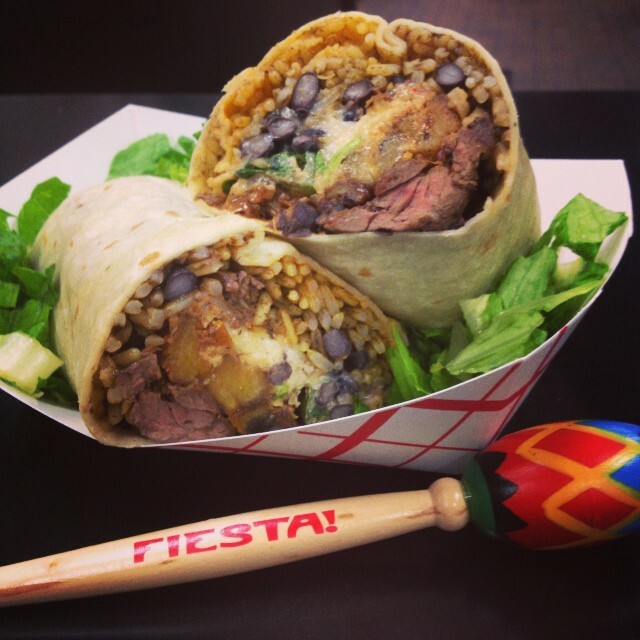 Grilled steak, Mexican rice, black beans, fried plantains, Jack cheese, fire roasted salsa, Romaine lettuce and crema. Grilled chicken. Black beans, Mexican rice, Jack cheese, Romaine lettuce and salsa fresca. Cut in half. Grilled chicken. Black beans, Mexican rice, Jack cheese, Romaine lettuce and salsa fresca. Cut in half. Cool menu. Now what do I do? Share a bit of info with us and we will contact you with some suggestions. Shoot us an email and we can help you order just what you're looking for. If you know what you're after, then go ahead and order that catering!